Outlaw King is the untold, true story of Robert The Bruce who transformed from defeated nobleman, to reluctant King, to outlaw hero over the course of an extraordinary year. Forced into battle in order to save his family, his people and his country from the oppressive English occupation of medieval Scotland, Robert seizes the Scottish crown and rallies a ragtag group of men to face off against the wrath of the world’s strongest army lead by the ferocious King Edward 1 and his volatile son, the Prince of Wales. Outlaw King is the biggest film made on “Scottish turf “and is regarded a “love letter to Scotland”. 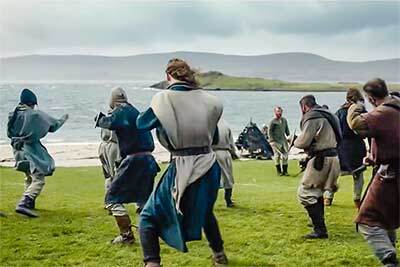 The stunning film locations will likely inspire folk from all over the world to visit Scotland. The film was entirely shot in Scotland, within the same boundaries as in Robert the Bruce’s era. Craigmillar Castle, Edinburgh: Scotland’s Capital’s ‘other castle’ plays an important role in the film as Robert the Bruce’s castle and village. Linlithgow Palace, West Lothian: In history, Linlithgow Palace was the base for Edward I during his campaigns of 1296 and 1301. It remained in English hands until it was captured by Bruce’s followers in 1313. On film, St Michael’s Chapel in the grounds of Linlithgow Palace stars as Bruce’s Castle Chapel and is where he is married to Elizabeth. Also look out for the famous fountain at Linlithgow in one scene. Doune Castle, Stirlingshire: The castle was built as the home of Regent Albany, ‘Scotland’s uncrowned king’. In Outlaw King, the castle plays a pivotal role alongside the character of James Douglas where he toasts Robert the Bruce. Glen Coe, Highlands: In Outlaw King it is seen in a sweeping shot with mountains and heather as Robert and his men make a hasty escape. Blackness Castle, West Lothian: A fortress located on the south shore of the Firth of Forth, it plays a particularly dark character in the new film as Elizabeth is captured. Glasgow University: Used as a location where Edward I is practising his archery skills and talking to his son. Talisker and Isle of Skye: Doubles as a location where Robert and his men take refuge. Loch an Eilean, Rothiemurchus: Used in the scene where the McDougalls attack the boats. Mugdock Country Park: The location was used for filming the climactic battle between the Scots and English at Loudon Hill. Seacliff Beach, East Lothian: Located four miles east of North Berwick and overlooked by the historic Tantallon Castle, we’re not going to give away too many spoilers here, but it may have a memorable moment at the end of the film! 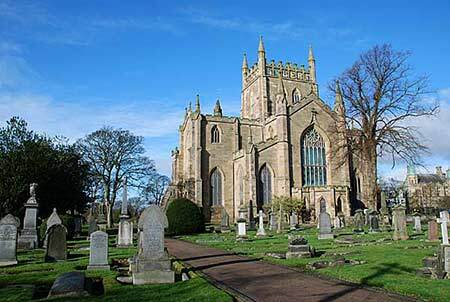 Other locations include Portencross, West Kilbride; Borthwick Castle near Edinburgh; and Tullibardine Chapel near Auchterarder, Perth and Kinross. Outlaw King has been released globally on Netflix on Friday, 9 November and is available via subscription from www.netflix.com .